Then, in an instant, the hook attaching the rope to the tower – broken and missing its safety latch – came loose. Guilford plummeted to the gravel below, landing feet first. The impact shattered his legs and burst his aorta. He bled to death in minutes. Tower climber Jay Guilford poses atop a cell tower. 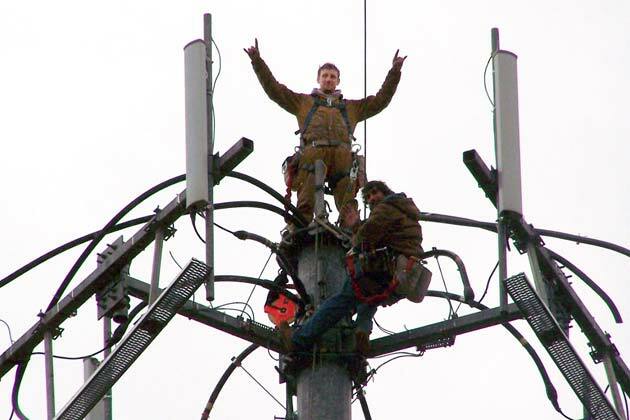 He was one of 11 climbers to die while working on AT&T jobs during a wave of cell service expansion from 2006 to 2008. Photo courtesy of Bridget Pierce. Ryan Knutson, PBS Frontline, and Liz Day, ProPublica May 22, 2012, 10:52 a.m. This story was co-published with PBS Frontline, which will air a film version today. Check local listings. Tower climbing, an obscure field with no more than 10,000 workers, has a death rate roughly 10 times that of construction. In the last nine years, nearly 100 tower climbers have been killed on the job. More than half of them were working on cell sites. Cell carriers generally outsource tower work, asserting that it isn't part of their core business. For the first time, our investigation has revealed the number of fatalities at subcontractors working on each carrier's networks. Guilford didn’t work for AT&T – he worked for a subcontracting outfit affiliated with a bigger subcontractor hired by a construction management firm working for AT&T. The carrier and its construction management firm, General Dynamics, had no employees on site when Guilford died – only subcontractors. Neither was sanctioned in OSHA’s investigation after the accident. But Waites said that those off site, like himself, could only do so much to ensure climbers’ safety – it had been up to All Around Towers, and Guilford himself, to follow the rules. Guilford left behind a fiancée, Bridget Pierce, and two young children, Emily, now 7, and Aidan, now 5. In her house on the outskirts of Murfreesboro, Tenn., Pierce keeps a framed picture of Guilford posing atop a cell tower. He’s smiling, his fists pumping in the air. After years of moving furniture and delivering pizza, he had loved his $10-an-hour climbing job, she said. Since 2003, an analysis of OSHA records show, tower climbing has had a death rateroughly 10 times that of construction. In 2008, the agency’s top administrator, Edwin Foulke, called tower climbing “the most dangerous job in America” at an industry conference. When they arrived back at the site two days later, there was a Nextel truck near the tower’s base. Hull assumed the carrier wanted to make sure the job was on time. He was mistaken – the driver was just a technician – but instead of returning to their motel to sleep, Hull and Ketchens immediately went to work. When Hull had climbed 240 feet to add a section to the tower, Ketchens pulled the wrong lever on equipment hoisting a huge piece of steel. The equipment broke away from the tower and fell to the ground – with Hull attached. His safety harness broke his fall momentarily, then snapped. Hull has no memory of falling or hitting the ground. When he came to, he saw Ketchens above him. “I said, ‘Frankie, I can’t live through this … You need to tell my family I love them,” Hull recalled. OSHA has the authority to cite carriers if it can prove they had direct control over work or knew of safety violations. Yet, even though some carriers set prices and timetables for tower jobs – and many of their technical specifications, down to how to color code coaxial cables – their supervisors typically stay off-site and do not manage jobs directly. Turf vendors – typically large construction management firms such as General Dynamics, Bechtel and Nsoro – oversee batches of tower projects, subcontracting out the climbing work to smaller companies. Hein did not have time to visit every site he was assigned to supervise – there were just too many, he said, a common lament among other construction managers for turf vendors. Turf vendors also take a cut of what carriers pay for tower work – sometimes 40 percent or more – so subcontractors say they make less on these jobs. Deckrow said his company – which often works as a subcontractor of a subcontractor – has been paid as little as $40 for installing remote radio heads. Overall, he said, he makes less than half the money working for a turf vendor that he would make working directly for a carrier. “Rather than paying this amount to this guy, who’s really qualified and … has a great reputation, they hire this person over here because he’s available right now and he’ll do it for what we want him to do it for,” he said. After the phone debuted in summer 2007, triggering a tsunami of data usage, customers began complaining about dropped calls and spotty service. According to a report inWired, AT&T went to Apple, asking for help in limiting traffic to buy time for tower upgrades. Instead, Apple Chief Executive Steve Jobs explored switching to Verizon, the report said. Craig Lekutis – the founder of WirelessEstimator.com, a trade publication for the tower climbing industry – said the stand down turned out to be “more lip service” and not a long-term commitment. With the next big push – building out 4G LTE networks – just getting underway in major markets, some veteran climbers worry that the fatality numbers will rise again. Coming next: How OSHA has struggled to police this dangerous industry. PBS "Frontline" will air a film version of this story today. Check local listings.